We want you to have a great experience with eCommunity and enjoy the apps and databases we've made available. If you have questions or need assistance, here is some information that may help. Need additional assistance? Get in touch with us! Feel free to email our eContent Librarian! You can also get in touch with us here. We've created Getting Started Guides for some of the most popular eResources we have. We'll continue to add to this list as we move forward. Have a database or an application you would like to see a guide for? Feel free to email our eContent Librarian!. The KCKPL eCommunity eCard provides immediate access to public library eContent and databases. You won't need an ecard though if you already have a regular Kansas City, Kansas Public library card. If you need assistance with getting an eCard, check out this tutorial. 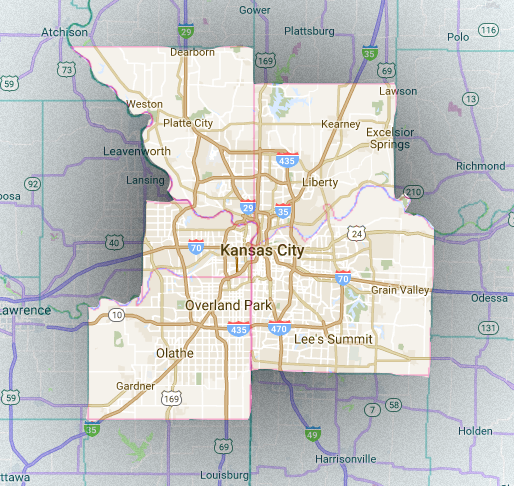 To qualify for an eCard, you must reside in the greater Kansas City Metro, this includes Wyandotte, Johnson, Platte, Clay, and Jackson County. Please see the map on the right, which highlights the metro area included. Find information to help you get started using eCommunity Services here. Flipster provides access to popular magazines online for free when you use it through Kansas City, Kansas Public Library. Click here for a guide to get started created by KCKPL. Kanopy is a film streaming service that provides over 30,000+ classic cinema movies, award-winning documentaries, and educational films. Click here for a guide to get started created by KCKPL. Hoopla provides you access to movies, television, music, audiobooks, ebooks and comics. You can check out up to 15 items from Hoopla a month. It's free with no fees or fines. Click here for a guide to get started. For extra help maneuvering databases click on the “Learn More” boxes below a database on our database pages. If there is not a “Learn More” box yet or if you need more information please email our eContent Librarian with your question. A collection of animated, talking picture book videos. Comprehensive information and unique insights into the military conflicts that have defined our world from antiquity to today. If you have questions about yearbooks or other materials in the Library's Kansas Collection, please contact our Kansas Collection Librarian. Thanks are due to the individuals and organizations which have donated yearbooks to the Library's Kansas Collection for digitizing. Thanks also to The Sumner High School Alumni Association which provided scanned copies of the Sumner High School yearbooks and reunion books. Please note that the Kansas City, Kansas Public Library does not have yearbook copies available for sale and the Kansas City, Kansas Public School District does not have historical yearbook copies for sale. This work is licensed under a Creative Commons Attribution-NonCommercial-NoDerivs 3.0 Unported License. For more information on this license, check the Creative Commons website. "The Kansas Collection, Kansas City, Kansas Public Library Yearbook Collection is a creation of the Kansas City, Kansas Public Library (625 Minnesota Ave. Kansas City, Kansas, 66101, 913-551-3280) in collaboration with the Kansas City, Kansas Public School District (2010 N. 59th St., Kansas City, Kansas 66104, 913-551-3200)." No Derivative Works - You may not alter, transform, or build upon this work. These materials may be printed at the standard charge of $0.10 per page. Please be careful to print only the page or pages you want. Some of these yearbooks were scanned to larger page sizes which may print out at a lesser quality than what is seen on screen. This is an on-going project, so the quantity of yearbooks scanned and available will gradually increase.